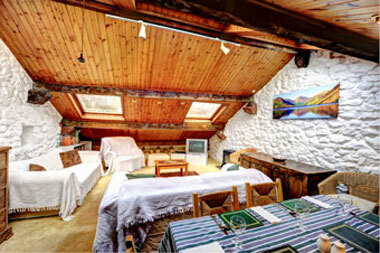 A holiday flat in an imaginatively converted eighteenth century Cumbrian barn in Gosforth, near Wasdale. The holiday appartment is modern and well-equipped, offering a spacious living/dining room, kitchen and 3 bedrooms. Wifi is available in the flat on request. The flat, on the first floor of the Pottery barn, will accommodate six people and has an outside barbeque area. Potters Barn can be let in conjunction with Well Cottage, making it ideal for families who would like to holiday together whilst enjoying their own house. Potters Barn holiday accomodation also has Wifi available.